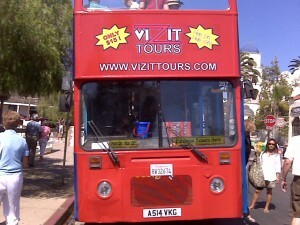 For those of you that want to get out and see San Diego without having to worry about navigating the city streets, Vizit Tours offers four new sightseeing opportunities aboard a vintage Double Decker open top bus. Every tour is narrated by a local tour guide that will tell you the history, facts and insider tips about each location throughout the tour. You can even hop-on or -off at any stop and get back on at a later time to complete the tour. Busses run every hour from 9 a.m. to 5 p.m. each day. Or, you can catch the one-hour nighttime tour at 6 p.m. The Balboa Park Loop: Seaport Village, Horton Plaza mall, Gaslamp Quarter, Balboa Park, San Diego Zoo. The Old Town and Harbor Loop: Horton Plaza mall, Little Italy, Old Town, Maritime Museum/USS Midway Museum. The Night Loop: Seaport Village, San Diego Bay, Little Italy, Gaslamp Quarter. This one-hour tour is perfect for a date or a fun outing with friends and family; adult beverages welcome so B.Y.O.D. (bring your own drinks). Prices: Tickets are good for two days and cost $15 per person, per loop or $35 per person for all four loops. This entry was posted in Tours & Sightseeing and tagged balboa park, Gaslamp Quarter, la jolla, little italy, mission bay and beaches, ocean beach, old town, pacific beach, san diego bay, seaport village, seaworld, zoo by Stephenie. Bookmark the permalink. I’m a Nor Cal girl loving my Sol Cal world. I have a passion for fashion but can’t ever quite afford it. I love to laugh and often crack myself up. I hang with the guys and gossip with the girls. I like to wear my stunna shades at night. What would you do on your ideal San Diego day? I would spend the day in Balboa Park and finally visit all the museums. If you were invisible, where would you go? I’d hit the beach and get rid of my tan lines… can you tan when you’re invisible?? What is your favorite San Diego outdoor activity? Catching a Padres game at PETCO Park, bike riding along the Pacific Beach/Mission Beach boardwalk or going to the Little Italy Mercado on Saturdays. Do you prefer burgers and beer or linguine and red wine? Burgers and beer all the way.